I WOULD REALLY RECCOMEND THIS. This is definitely worth the money and I have been pleased with it. 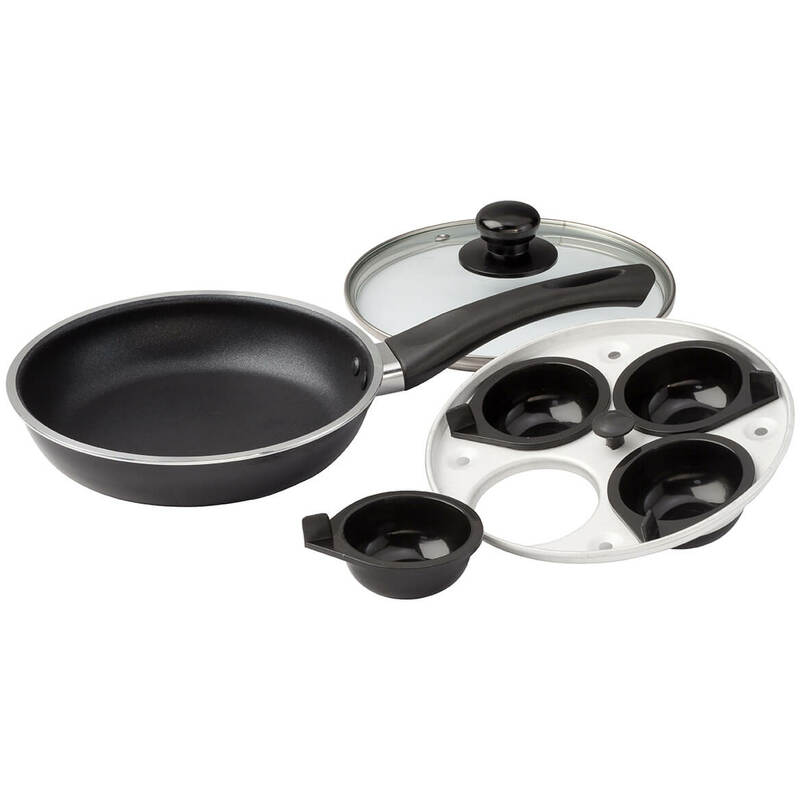 I WAS REALLY SURPRIZED WHEN I OPENED THE BOX AND FOUND A VERY WELL MADE PAN WITH PARTS TO POCH EGGS 4 AT A TIME KEEP UP THE GOOD WORK ALSO A GOOD PRICE THANKS A LOT. Only one thing; spray the egg cups with Pam, otherwise a great product. My old poacher was just about wore out and I needed a new one. I love poached eggs and do not have a egg poacher. 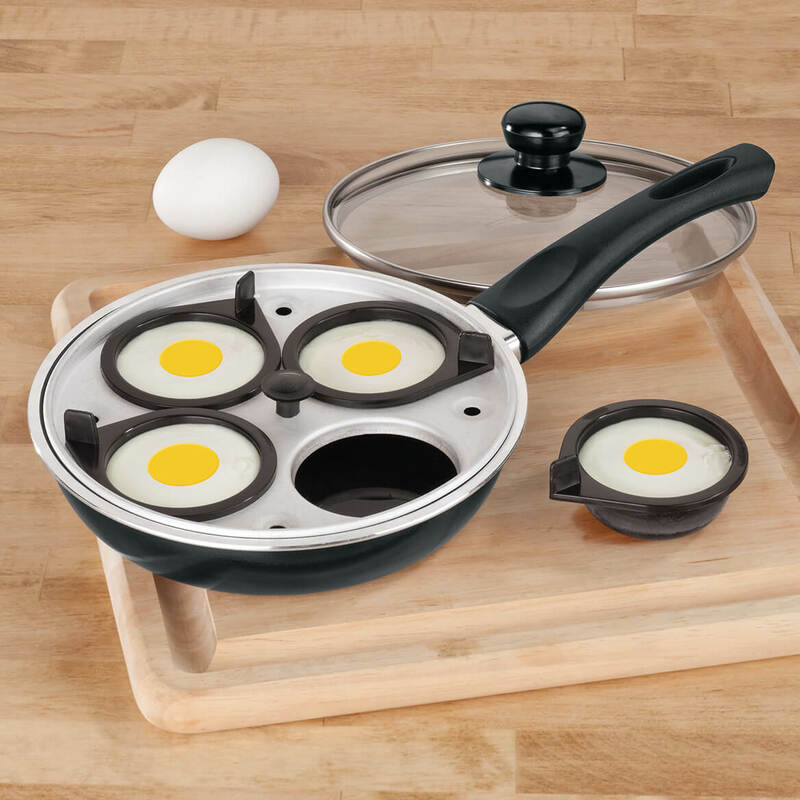 I have been looking for a Egg Poacher for a long time and this is the one. I have one, this is the best pan in tv/market. I have 2 egg poacher that I have to use 2 times for my 4 eggs. I have been wanting an egg poacher so when I saw this decided to buy it. I have one egg poacher and have not been able to find another one. This is 2 ways for user, love it! I love this. A great price, also. I like that this has the removable egg cups, and that it has a glass lid. The old skillet insert I now have is very hard to clean, and a handle that doesn't fit under the lid. Found what i been looking for. I use to have one a long time ago and loved it. I choose this one because you can cook four eggs. My husband and I are trying to eat healthier. This will be excellent for that. I usually prepare poached eggs by placing cracked eggs in boiling water which results in having to scrub the bottom of the pot afterwards. But with this item, since the eggs will each be in little non-stick cups, I am hopeful that it will eliminate this problem. I like poached eggs and a frying pan with a lid. Hard to find item and it looks like excellent quality and the price was reasonable. I was looking for an easy way to fix poached eggs. This is an uncommon item and hard to find! So glad you offered this in preparing breakfast eggs! Been looking for one for quite some time. I have had a pan similar to this previously and loved it. Had one in the house growing up so many years ago and never had one of my own. Makes the perfect poached eggs with contained form and not sitting in water. I have a six cup poacher but wanted a smaller one for two. Upon review of this product and reading comments from actual users I decided to purchase it hopefully it will live up to the comments of actual users. Can I do one egg at a time and is it feasible to add peppers, onion and cheese to the egg mix? How long do you poach the eggs for a medium well done? BEST ANSWER: Thank you for your question. You cook the eggs approximately 3-4 minutes. We hope this information will be of help to you. Are the egg cups plastic or metal? The cups are plastic. The surrounding piece the cups fit into is metal. The egg cups are plastic. I have one and love it very. They are plastic, but they work well. The ones I have are plastic. BEST ANSWER: Yes you do but this is not a good product. I sprayed egg cups and eggs stuck very badly. Also you have to attach handle to pan and i wasnt able to tighten it down completely. I do not recommend this product. Yes, water goes in the bottom of the pan. Put eggs in the cups and cook for however long you want. You can make hard poached eggs to make Egg Mcmuffin like sandwiches. will this work on an induction cook top? It , will work just fine. How large is pan and what isit made of? BEST ANSWER: Thank you for your question. 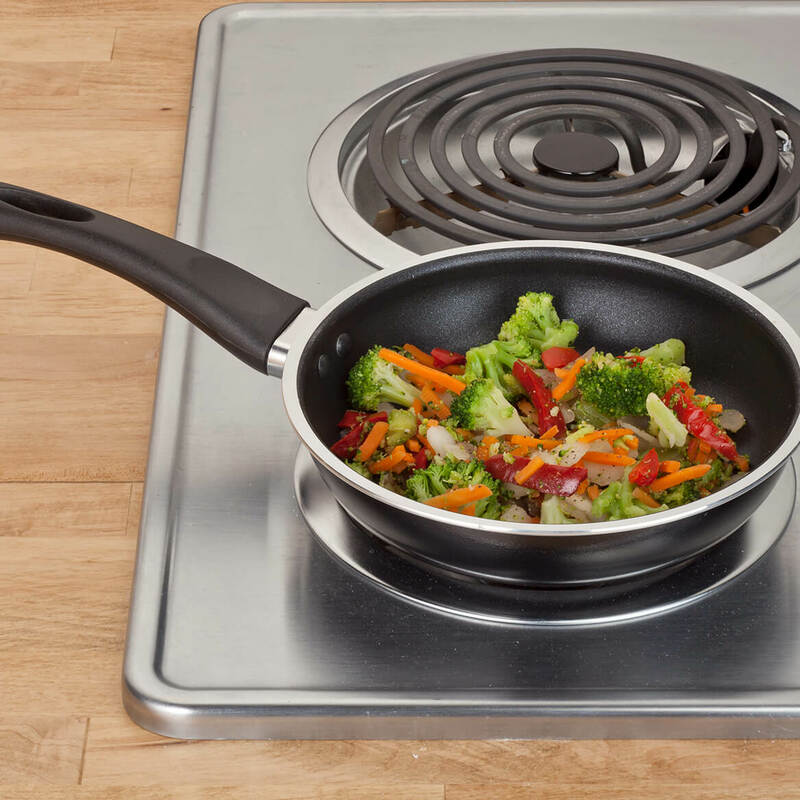 It is a non-stick aluminum pan that is 7 3/4" dia. We hope this information will be of help to you. BEST ANSWER: Thank you for your question. Unfortunately we do not carry the replacement lids. We hope this information will be of help to you.